A big thank you to everyone who participated in the museum pub quiz and raffle. Over £350 was raised for museum activities! 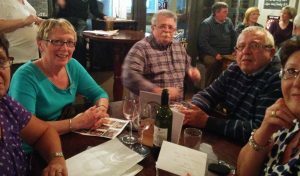 The quiz was won by the `Sahara Desert Canoe Club’ (pictured). The lucky winners each received a dinner at Bon-O-Phool Indian restaurant. Congleton Museum is open over Easter! Looking for a fun family activity over the coming Easter Bank Holiday? Why not pop in and visit the museum? Congleton Museum is open as usual on Good Friday, Saturday and Easter Sunday!